There is so unendlessly much one could relate about the connection between the hygienic-therapeutic and eurythmy. Today we want to take into consideration that part of the physiological which we discover in the proximity of the spiritual when we contemplate a eurythmic exercise. Of course, all that which can he observed in this connection in artistic eurythmy will be encountered in an intensified form when one makes the transition from artistic eurythmy to the fortified eurythmy we have become acquainted with in these days. Nevertheless, the essence of that which concerns us can already be discovered purely artistically in a performance of eurythmy and the physiology corresponding to it then sought out. Let us try this by carrying out the following. Perhaps Mrs. Baumann will be so good and perform the poem “Über allen Gipfeln ist Ruh” alternately in vowels and in consonants, while you (Frau Dr. Steiner) recite it. Now let us make clear to ourselves what is taking place here, proceeding however very exactly. What is happening? A poem is recited. The person who does the eurythmy listens — he is the one who comes for us into consideration physiologically. That is the first matter of importance. He doesn't speak himself, he listens. That is essential. He listens to something which is in essence the meaningful word, a meaningful association of words. He listens to something in which the activity of thought and of mental representation are alive. What he perceives outwardly is the activity of mental representation clothed in an association of sounds. That is something which man in his waking, daytime existence often does, is it not? But what actually takes place when he does it? If you consider the process from a psychologic-physiologic point of view you will easily discover that a light, partial sleep overtakes the listener. The “I” and the astral body glide over what they are taking in, they live into it. In listening man steps out of himself slightly. He is overcome by a condition which is similar and then again dissimilar to sleep. It is similar to sleep in that the “I” and astral body are slightly disengaged, dissimilar in that they remain receptive, perceptive and self-aware. Thus the process is extraordinarily similar to imagination. It is a subtle, conscious imagining that is still strongly suppressed in the subconscious. Such is the process at hand. To every such process is a reaction within the human being himself; we take this into account as well. Let us look at what takes place in the person who is not reciting. What does he do when he listens? He brings his etheric body into motion. The etheric body reacts. in fact the etheric body takes up those movements which it carries out — only much more weakly — when the person is asleep and has left his etheric body behind in the physical body. When the human being is asleep the etheric body is considerably more active than when he is awake. During this dampened sleep taking place in the listener the movements of the etheric body are awakened to a greater degree. These movements of the etheric body can be observed. Thus in the listener one has a person demonstrating in a heightened manner the movements which the human being carries out otherwise in a a weakened form in sleep. Thus you can study in the listener, who promptly performs them for you, ether movements of the human being in sleep. It isn't at all necessary to study the person while asleep; one can study the etheric movements of the human being when listening and has in fact here the heightened movements of the etheric body in sleep. One studies these movements and has them carried out by the physical body. That is to say one allows the physical body to glide into all those etheric movements which one has studied in the manner just described. Thus in eurythmy one does what the human being carries out with his etheric body constantly while listening. You can see what is actually taking place. Now that we have observed what actually occurs, its effect will become apparent as well. The result is that by means of the physical movement one carries over into consciousness what otherwise occurs unconsciously. One stimulates the astral body and the ego by means of this detour through the physical body and strengthens them. But what happens as a result of this? When the astral body and the ego are strengthened in this manner their activity becomes similar to the activity in the child and still growing person as it occurs naturally. You are calling upon the forces of growth in the human being. You are working directly into the person's forces of growth. If the person is still a child and shows signs of being retarded in his growth, you can stimulate his growth in this way. If the person is no longer a child, and the forces of growth have already diminished, or if the person is actually in the second half of his life, one calls upon the youthful forces, the rejuvenating forces in him which, however, cannot contribute to his growth since the human organism is, of course, fully developed. We can expedite a child in his growth or combat his abnormal growth by having him do eurythmy. In the case of the fully-grown person the inner organism presents too great a resistance to the outer organism for us to be able to make him grow. Nevertheless, we can still introduce these forces of growth. The result is that they crash against the resistance of organism and metamorphose; that means that they activate in their metamorphosed state the plastic force of the inner organs. They stimulate the plastic force of the inner organs and these inner organs learn to breathe better and to better digest. They are encouraged to fulfil the necessary activity of the human organism in its entirety. When artistic eurythmy is performed one should not think of it in the first instance as curative eurythmy; nevertheless, in the moment a person begins to be abnormal in any way it will have a curative effect. We have already seen the examples where when the usual eurythmy is reinforced, the reaction which follows is naturally also strengthened and we can form a mental picture of how this eurythmy affects the plastic qualities of the organization. You can understand that the habitual practise of eurythmy activates the plasticity of the organs, their plastic force, and that as a result the human being becomes internally a better breather, a better person, if I may express myself so, in respect to his inwardly oriented digestion. He becomes a person who has his whole organism more within his own discretion. He becomes an inwardly more agile person. And to become a true artist is nothing other than to make the inner man more flexible, plastic, agile. That can be seen when one sculpts, for example. One cannot sculpt properly if in experience one cannot transpose oneself for example into the figure that one is developing plastically, if one cannot bring to life in oneself the forces that are building the figure, that express themselves in the figure. If, however, one sees the human organism itself as an implement and carries out what corresponds within, then what is the case in outward artistry is in a higher degree the case here as well for at this point one can do nothing other than to call forth internally what corresponds to the outward movement. What I have just said about the physiology of eurythmy is specialized here. When only the vowels are carried out then that which I have characterized does not come to expression in its entirety. What I characterized is correct when someone speaks and the movements for consonants and vowels are made alternately. For what we have just done is that which I said not entirely correct: it will have to be specialized. Here very specific, differentiated movements have been performed all of which prove to be movements within the etheric body having primarily to do with what lies in the rhythmic system. Thus we must fasten our attention on that system which — as an etheric system — participates especially when vowels are spoken. When a person listens to vowels — which occurs of course in so specialized a manner only in eurythmy and to which for this reason attention must be drawn as it is here especially important therapeutically — when one recites a simple sequence of vowels for this person, or when one has him carry out such movements, in which case he would be listening to the movements which are the forms of expression for the vowel element while doing eurythmy — then, in the normal person listening to vowels those movements of the the etheric body corresponding to the rhythmic system become active in the way described earlier. And now you have the person doing eurythmy carry out in turn those movements through which he glides with his physical body into the movements which are otherwise manifest in the etheric body when vowels are heard. That is how the matter is specialized. In this way in particular those organs which belong to the rhythmic system are stimulated to respiration and inward digestion. These organs are strengthened; in them the appeal goes out to the forces of growth in the growing child or to the plastic forces which have their resistance within the organization of the fully grown adult. 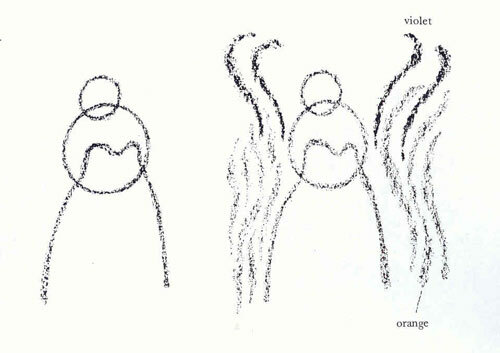 This will serve as an introduction to the physiology of the vowels in eurythmy. Thus in applying to therapeutic ends everything derived from the vowel-element in eurythmy you will be able to affect the rhythmic organs in particular. Now perhaps Mrs. Baumann will do the same poem once again consonantally. A mere glance will testify to the radical difference between the consonants and the vowels as they are carried out eurythmically. The difference is indeed thoroughly radical. If we wish to study what we have just seen we will have to make clear to ourselves how the matter would lie if in ordinary listening we were to hear only the consonants. For civilized man that is seldom so, but among less civilized peoples it is sometimes the case that they must listen to much of a consonantal nature. The consonantal world in speech is appreciably richer among less civilized peoples, and the transition from one consonant to another is stronger and unilluminated by a vowel lying between. You will find it possible to observe this up to and even within Europe. just look at words written in the Czech language and you will see just what combinations of consonants are present. To be sure when the words are spoken the vowel element sounds within these combinations of consonants, but it permeates them only as a continuous, hardly differentiated undercurrent. And if you listen to Czech you will say to yourself: to listen to this consonantal element is entirely different from listening to a language that is thoroughly permeated by vowels. Thus one has to do with quite another process here which can be characterized best in the following manner. As an ordinary listening process this process calls forth strongly those movements of the etheric body which are otherwise actually carried out in the case of physical movements. They are retained and so, while listening to consonants, the human being lives in a certain tension. Unconsciously he would like to be imitating outwardly, physically, when he listens to consonants, but he holds back. The situation is alive with tension: a state of pacification prevails, but an artificially induced pacification, called forth by the power of one's own ego in opposition to those movements which demand to be carried out. Volition dammed up within itself is manifest when consonants are heard. Therefore you will find that listening to consonants is inwardly exceptionally invigorating. If one has an eye for it one can study how peoples such as the Czechs comport themselves inwardly — how, the human being deports himself in his interior in relation to these tensions, these aggressive forces once one knows that they are built up out of the consonantal element of the language. It is a continual curbing of what unceasingly strives to become physical movement. Once again it is for the human being a stepping-out, a going over into the condition of sleep, and this going out, this transition into sleep is extraordinarily interesting. Consider the human being schematically: head, rhythmic system, limb-metabolic system. In listening to consonants it is primarily the limb-metabolic system that is engaged. The person wants to move his limbs, wants to break into movement, but the movement is converted into tension. He passes as it were into a state of sleep which actually does not take place in other respects, for the ego and the astral body — which go out in ordinary sleep — remain within the organism. One even tries to bring about a sort of artificial sleep for the limb-metabolic system in this case. But when one falls asleep in the limb-metabolic system to a degree, a strong reaction makes itself evident. This reaction consists of dreaming. However, at the moment one's consciousness is not so organized that one can dream. Dreams come into being that play about the human being. (orange). They affect the outer astrality and the outer ether. People who listen to consonants reinforce the aura in their proximity. This expresses itself in turn in its polarity: what remains here in the subconscious as polar content plays about the head as a volition-feeling factor and penetrates into the organism of the head. (violet). Therefore you may notice an intensification of wilfulness and caprice in people who are accustomed to living in the consonantal element. Dreams transformed into will play through the organism of the head. What are dreams transformed into will from a physiological point of view? If one examines the etheric-physical correlative, it is essentially what is plastically at work in the organization of the head. The plastic effect on the organization of the head is pre-eminent and in this manner it will be possible to activate to a degree the organization of a head which is retarded. If one has to do with a feeble-minded person, or with someone where it can be demonstrated physically that his head organism is not in order, one should let him do consonants in eurythmy. Then one engages oneself with those forces which otherwise work as dream-like will in the entire remaining limb-metabolic system, which stimulate there the organization and preserve its activity. One makes the heads of imbeciles and those who are otherwise retarded in their head-organization more active. Thus one can employ this sort of eurythmy to arouse curative forces for the organization of the head, particularly when one carries it out in the intensified form, with the strengthened form of the consonants of which we have heard in the last few days. It is natural that when one wishes to consider the physiology of eurythmy one should keep the active moving human being in view. In ordinary physiology one actually does not pursue physiology at all: even when an experiment is conducted on the living one proceeds from the mechanical; or one starts with the corpse and draws conclusions about physiology in actuality. One then arrives at something which one has inferred. If one wishes to attain to a physiology of these processes, what one otherwise infers must be read from inner activity of man. And it will be seen how this sort of study will quicken the whole of physiology. Consider alone the following: what is the process of digestion as observed in the living human being? It is metabolic activity which thrusts itself into the rhythmic activity, which unfolds in the direction of the rhythmic. Digestive activity is metabolic activity which is caught up to a degree by the rhythm of the circulatory organs. A continuing process, which is a combination of the metabolic activity and rhythmic activity (completed by the German editor) is taking place here. When the rhythm pulses up against it, what is metabolic activity in the lymph is caught up into the rhythm of the organs of circulation and pulled along with it. The more chaotic activity — the chaos astir in the movement of the lymph — is taken over into the rhythm of the circulatory system. Physically human volition lives there where the chaos of the lymph goes over into the regular rhythmic functioning of the circulatory system. One must distinguish this activity of will, which consists in the continual transition taking place between the chaotic vigour in the lymph and the rhythmically regular, harmonising activity present in the circulatory being, from the outer activity into which it however pours. It is, nevertheless, in this way that the inner world of man lying within the skin brings itself into harmony with the outer being of man. Through the subordination of his personal being man encorporates himself into the being of the outer world. Therefore, when one influences this activity through eurythmy — as we have seen with the consonants — one counters in fact the human being's tendency to become self-willed, to become egoistic, and his tendency to become organically egoistic as well. What does it actually mean when man becomes egoistic? Organically expressed it means that the force of plasticity in the organs is diminished and the rigidifying, crystallizing tendency takes the upper hand. The organs no longer want to be modellers, they want to become more crystalline. By means of consonantal eurythmy this tendency can be counteracted. Here you have an insight deep into the human organism. Egoists are always people whose organs threaten to take on a proper wedge form. They want to become wedges, to become crystalline, where as in the case of people who are pathologically self-less, these organs expand. They have no crystallizing agency; they have plastic forces and become round. That is also a pathological condition. It is always the swing of the pendulum from one extreme to the other to which one must pay heed. Consider what spiritual activity is: when man thinks and from out of his thinking feels — that is designated spiritual activity in normal life. It is carried out by the most physical part of the head organism and is for precisely this reason the sublimating spiritual activity, the individualizing on the one side, the abstractly felt on the other. When the human being carries out this activity, what happens then? He draws out of his organism the force that enables him to encorporate him-self into the outer world. He draws out of himself the force that, pathologically, entices him to expand. He makes a crystallizer of himself when he is spiritually active. Certain peoples, the more northern peoples in particular, have developed a strong instinctive consciousness of these matters. Today they have as yet no inclination to introduce eurythmy in accordance with this instinctive consciousness. They employ instead what is more outwardly physiologic, Swedish gymnastics and so on. Nevertheless they make decided use of the characteristic alternating effect, by alternating the activity which the children must carry out in scientific study in school — when they must think and so on — with what diverts them to movement. They expect every teacher to be a gymnastic teacher as well and require on the other hand that the gymnastic instructor stands at the spiritual level of the child. Such things should be taken into consideration in an advanced civilization. However if I may make a statement that may appear to be a bit nasty, but is really meant only to enlighten, one must have time if one wishes to take these matters into account instinctively. Such things must be carried out by those peoples who take less part in the process of civilization, who live a life apart, more for themselves, and who are thus able to gradually develop instinctively that which has to do with the rhythm of spiritual and physical activity. The Swedes and the Norwegians who lead a more isolated existence, for example, can put such ideas into practice instinctively particularly well. For others the practice of such matters must be more conscious since these peoples are more engaged in the world processes in general — people, for example, who must concern themselves — as was of late very much the case — with making war and so on. These peoples must see these matters much more consciously. And those nations that stand in the centre of the world's movement, who must take part in its affairs while the world turns around them so to speak, they will soon see what they will get themselves into if they do not turn to these things consciously, how they will gradually degenerate. That is something which Switzerland in particular should take to heart. These things can be observed to play a part in the state of the world as a whole. The general conditions prevailing in the world are, of course, the result of human activity and even today they proceed more from unconscious human activity than from conscious activity. We are given the task, however, to gradually transmute the unconscious activity of man into conscious activity. How does this spiritual activity work in man? It awakens the crystallizing forces. In people with weak egos it strengthens the “I”, it makes the ego more egoistic. In people who effuse organically because they are not sufficiently egoistic we will find it necessary to activate the forces of egoism not for the benefit of the soul, but for the body. We could stimulate them by outward means as well; it would be natural to advise people who effuse organically to consume substances containing sugar. However, they sometimes have an antipathy towards them — a fact which gives expression to the true state of affairs. However, that is something of much less interest to us at the moment. What interests us just now is that through the vowel element in eurythmy one has the possibility of working most effectively in this direction; one can bring the human being organically to himself through the vowels. One can awaken the forces which bring him to himself organically. For certain people that will be most necessary, among them the sleepy headed people. One will find that the alternation between the two, between the vowels and the consonants in eurythmy, will work favourably as well as it enduces a living rhythm in the human being such as should exist between opening oneself to the world and retracting into oneself. That will be called forth by alternating consonantal and vowel elements in eurythmy. It is, of course, particularly important, when one intends to apply eurythmy for therapeutic purposes, to make one's own what I would like to call this physiologic-psychologic perception of what actually takes place. One should understand that the person who does consonantal eurythmy tends to call forth around himself a sort of aura which works back on him and brings him out of an egoless mingling with the world; in the case of the person who does vowels in eurythmy, his aura is drawn together, densified in itself, which is, of course, always the case with spiritual activity as well, and that the inner organs are thus stimulated to bring the person to himself. Pedagogically considered, alternating between the lessons one would place more in the morning hours where more mental work would be done and the lessons in which there would be more movement and where a great deal of eurythmy would be done calls forth rhythmic activity in the growing child that has an extraordinarily beneficial effect; all the detriments that are of necessity incurred through an improportionate mental exertion are balanced out again by doing eurythmy. For this reason eurythmy has an especially beneficial function within the curriculum as a whole. That which I have to say about eurythmy particularly to the physicians I will convey in the course of my lectures to them. Thus we conclude our consideration of eurythmy as such here. Tomorrow there will be two consecutive medical lectures where the eurythmists are not present.